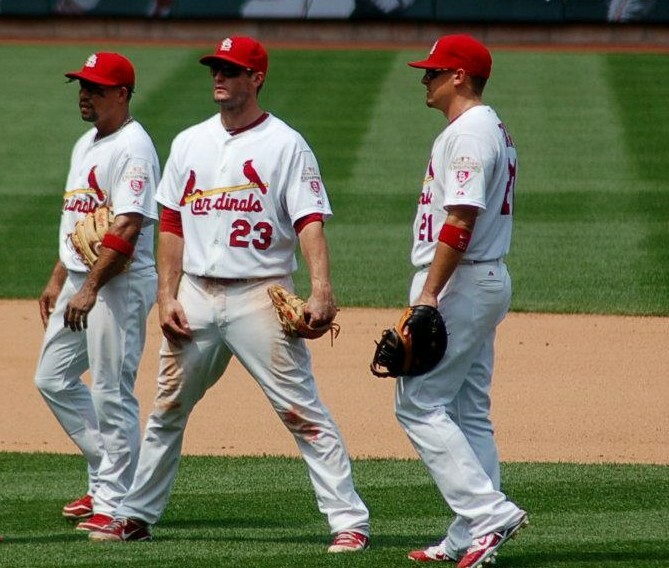 The talk of the spring — much like the offseason — has been the question mark hanging over the Cardinals’ middle infield. The focus, though, has been on second base. With Matt Carpenter attempting to learn the position, and Daniel Descalso once again fighting for the every-day job, the story is the most intriguing of training camp thus far. However, what about the other piece of that middle infield? So far this spring, Furcal has been more than cautious. They’ve been more than careful. And, from the outside, it sure looks like they’re anything but confident. There’s good reason for that, of course. Namely, he can’t throw a ball. At least not anywhere near 100%. Furcal continues to participate in most of the team’s defensive drills. When it comes time to throw, he’ll either hold the ball or throw it at less-than-max effort. Now, I know it’s early. And that he proved last season he doesn’t really need a good spring to be ready to go on Opening Day. But, I’d be lying if I said the forced positivity made me feel better about it all. Even the fact that Ozzie Smith was at camp, hoping to “advise” Furcal on how to change his fielding technique to accommodate the elbow trouble, only makes me feel minimally better. Oh, and then there’s the fact that the Cards made a concerted effort to sign Marco Scutaro over the offseason, with John Mozeliak recently making comments about how Scutaro could play short stop if necessary. So … what does that all mean? Well, I believe the Furcal’s health creates a bit of a domino effect. If he’s not healthy, who takes over at second? And, how does that impact both the lineup and the rest of the infield positions? Raffy hit .264 in 477 at bats through 121 games. He had 18 doubles, 49 RBI, and 12 stolen bases, with an on-base percentage of .325. Defensively, he started 116 games at short stop with a fielding percentage of .972. He made 15 errors, and turned 68 double plays. Then, there’s Pete Kozma. He only played 26 games in St. Louis. Ah, those 26, glorious games where he hit .333 with five doubles, three triples, two homers, and 14 RBI. His OPS sat at .952. And yes, he had those few, miraculous moments that made him a post-season hero. He played 25 of those 26 games at short stop, in place of the injured Furcal. He made 3 errors in 197 innings, not including the Wild Card game fiasco with the infield fly. Ryan Jackson has been mentioned as an option. Of course, we thought so last year, too. Instead, he sat … and sat … and sat. He saw just 13 games with the big club, hitting a forgettable .118 and spending most of those games at second base. In Memphis, though, he spent 102 games at short stop where he helped turn 65 double plays, and posted a .929 fielding percentage. And then there’s Ronny Cedeno. The Cards’ newest addition played in just 78 games last year with the Mets. He hit .259 with 4 home runs and 22 RBI. He spent 28games at second base, 27 at short stop, and 3 at third base. The flexibility is nice, for one thing. In total, he was part of 19 double plays, and four errors. Those numbers aren’t flashy (any of them). If Cedeno has a comeback year, his experience could be helpful. But, if not, the Cardinals are left with a serious gap at short. Throw in a newbie (potentially) at second base, and I shudder to think what some of those all-important double play throws will look like! So, what do you do here? How do you really prepare for a season of Furcal at short and fill in the blank at second without Furcal able to practice at short? Which contingency plan evokes the most confidence? How much do you really need to see out of Jackson for him to earn a shot? And, most importantly, how do the rest of the dominoes fall based on Furcal’s ability to field a baseball? With all there is to be excited about this spring, this is the dark cloud. Maybe it’ll be fine. Maybe Raffy will be fine. Maybe it’ll be his best season in years. Maybe. But I don’t particularly like maybes. Pete Kozma’s September to Remember was powered by a .415 average on balls in play. You could take all of the fielders off the diamond completely and be hard-pressed to come up with a .415 average again. The Cardinals best option at shortstop if Rafael “Progressing Nicely” Furcal falls apart is not Kozma, not Ryan Jackson, but Ronny Cedeno. Which, to be blunt, doesn’t make me feel any better.